As with any charity, keeping costs down and securing the most competitive rates from suppliers is a high priority. However, for David White, Head of Procurement at Sue Ryder, a top-class procurement consultancy needed to offer much more than great savings. After a benchmarking exercise against another provider, ERA’s fully engaged and highly personalised service completely overshadowed their nearest rivals and the contract was awarded. 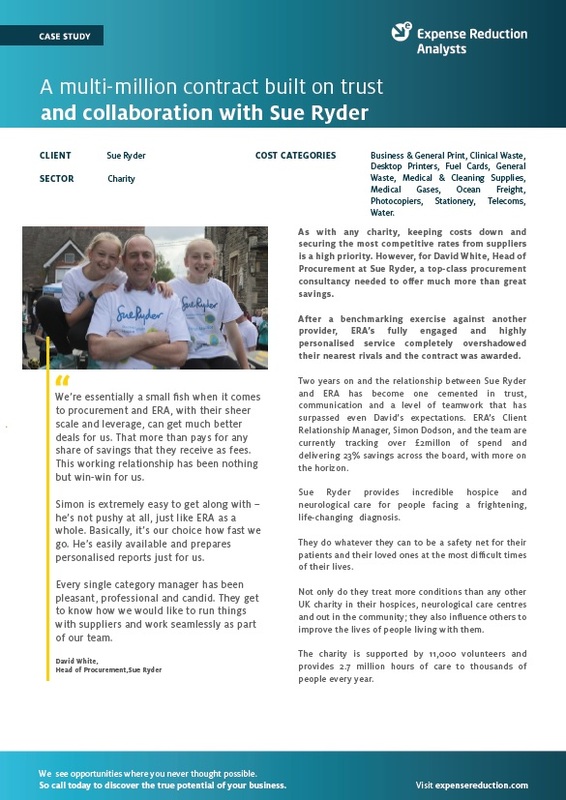 Two years on and the relationship between Sue Ryder and ERA has become one cemented in trust, communication and a level of teamwork that has surpassed even David’s expectations. ERA’s Client Relationship Manager, Simon Dodson, and the team are currently tracking over £2millon of spend and delivering 23% savings across the board, with more on the horizon. Want to know more about how ERA can help your organisation? Contact us today and speak with our team.